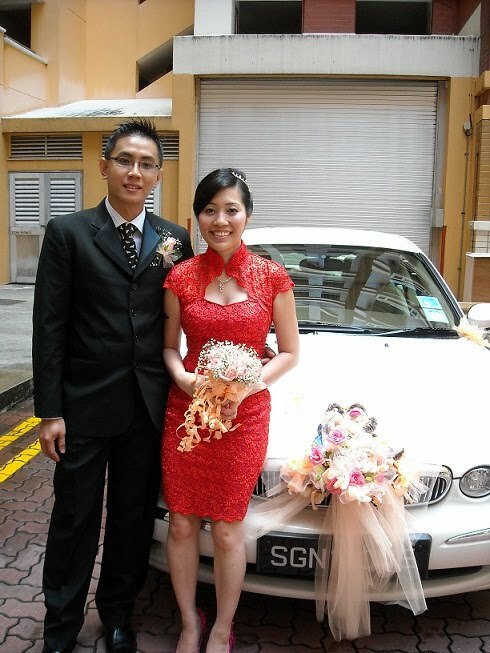 Rent Bridal Car: Congratulation to Kok Choon and Tiffany! Congratulation to Kok Choon and Tiffany! Newly Wedded on 11 Sep 2010! For all soon-to-wed couples out there, look no further!! You have just found THE bridal car to rent for your wedding! Edmund provides priceless advices and assistance and will go to great lengths to help you make the day a success! Being a car-proud owner of a fantastic looking white jaguar, Edmund takes superb car of the car. It really looks and feels brand new!! Especially when he'll make sure the car is polished the day before the wedding!! The classic appearance of the car with its powerful engine and sparkling exterior is sure to make a grand entrance coming down the driveway when the groom arrives to pick the bride up! The clean and spacious interior can accomodate the bride's gown with its long train plus room to spare! Edmund's smooth driving makes the trips a breeze - he doesn't skimp on the petrol either - only Shell V-Power for his car! His knowledge of the driving routes helped alot too! Our wedding was on 11th Sept - same day as the Chinatown Mid-Autumn Festival lightup. There were major road closures on the way to our hotel (Grand Copthorne Waterfront) at Havelock Road. He managed to take a quick detour and got us to the hotel in the shortest possible time - more time for us to rest before the dinner! Our 'brothers' and 'jie-meis' who left the house at around the same time got to the hotel almost 1 hour later!! Edmund has always been on time the few times we met - to view the car, to do the decors, to pickup the bride... He also understands that with the hectic wedding preparations, the groom might forget certain things - he'll SMS/email you to remind you of the dates for bridal car decorations, pickup timing etc.. He's most accomodating - I'm Teochew so we had to pickup the bride before daybreak.. He got to my place in the wee hours to pick me up! He was also ok even though we made some last min changes to the schedule. Edmund will also provide helpful tips for the groom and 'brothers' to get through the gate crashing!! Anyone who wishes to verify this testimonial can feel free to contact Edmund for our contact details! I'll be glad to give him another glowing testimonial.